First things first: This first blog post for My First Cadaver is about the first episode, which is also Faith Aeryn’s first podcast. That may seem like a lot of “firsts”, but we here at My First Cadaver are in the “firsts” business. Med school and residency “firsts”, to be specific. And when we say “business”, what we actually mean is “beeswax”. You know, the sort you’re supposed to mind-your-own, but we don’t mind if you don’t! We love hearing and sharing real, personal stories and have found that, when chosen with care and intention, they can also be a fun and important tool for learning how to process the complex emotions associated with becoming a doctor and, in same cases, not becoming one. All lives have a definitive end, but they have many, many beginnings. My First Cadaver explores and celebrates this and our blog reflects its values, as well as the content. So now we begin... and every blog’s gotta start somewhere. FAITH AERYN: I’m Faith Aeryn, and this is my first… well, it’s my first podcast! I always thought I’d go into medicine. My hands are steady; I love math and science and solving puzzles; and I wanted to help people as a doctor. But that all changed when I met my first cadaver. I’m getting ahead of myself. Let me back up. My mom catches babies for a living, and a bunch of my aunts are nurses and physical therapists, so spending time in the hospital was a routine thing when I was growing up. In addition, my dad was a reporter, and I was a smart, inquisitive kid, so questions were definitely encouraged in our household. In grade school, I was in the Gifted and Talented Education Program — which is an advanced or honors program. So instead of doing dissections in middle school like most people, I did mine in 4th grade. I was in year-round school and it was a scorchingly hot summer day. Our science lab was in one of the portable buildings at my school, and the air conditioning was on full blast inside the frigid, formaldehyde-scented room. Enter: Big. Brown. Cow. Eyeball. I come from centuries of dairy farmers on my dad’s side. I knew this eye. Sweet. Innocent. All too familiar. It reminded me of my friend Bessie the cow back in New Jersey and there was no way I could cut it open. I was horrified. And lightheaded. And I have to tell you — it didn’t get any better when the pig’s fetus showed up. Revulsion eclipsed curiosity and all dreams of doctor-hood just disappeared. Goodbye, future Doctor Me! I mean, seriously. If I couldn’t handle dissecting livestock, how could I ever cut open a dead person, much less a live one? So here I am, many years later, still fascinated by medicine. And while I couldn’t wield the scalpel as a kid, I can cozy up with this awesome microphone and talk to med students and residents and MDs to better understand the medical (and med school) world. Now, please excuse me as I live a bit vicariously and work through the mental road block that stopped my brilliant career before it even began. As a med student, your Gross Anatomy lab (cadavers included) begins in your first semester — sometimes even on the first day of med school. So, in my conversations with medical professionals and med students, my first question was: Do you remember your first cadaver? DR. DANIEL MASELLI: Yeah. I do remember our first cadaver. FA: That’s Doctor Daniel Maselli. A recent graduate of the University of Massachusetts Medical School. DM: We’d been at school for about two months and we were provided with a cadaver. Which is just remarkable and strange and beautiful in a lot of ways that someone would give their bodies up for the sake of a medical student’s education. It was very anxiety producing because there’s this question that you ask yourself throughout medical school, “Am I worthy?” There is any number of things that people are doing on your behalf tremendous sacrifices that people are making and you kind of question yourself all along saying, “Am I worthy of this? Am I worthy of this?” And this Anatomy Lab is part and parcel of that uncertainty and that doubt because it’s a tremendous gift, a tremendous sacrifice in a lot of ways… So there was this tremendous amount of, “Whoa…am I going to make the most of this situation? Am I going to justify this gift that someone has given us?” Then there’s just the obvious anxiety of we are dissecting a human being and that is nothing like I had ever experienced before. I mean you dissect any number of things in your prerequisite pre med classes. I think the largest I had ever gotten up to was a frog. I know some people had done pigs or cats but I think frog, I never even made it out of the reptile phylum there. FA: The second he said reptiles it jolted me back to one of my least favorite smells, formaldehyde. So, of course, I asked. DM: The smell, it’s funny that you bring that up, that is probably one of the most memorable things. Formaldehyde has a very distinct smell and it permeates the entire basement level that the UMASS Anatomy Lab exists in. But the nice thing about formaldehyde, sort of metaphorically, is that — I mean, it physically preserves protein and it also was a very nice preservative in terms of forming this tangible memory and experience for us because the Anatomy Lab is something that we carry with us for the rest of our experience there. Something we carry with us for the rest of our experience in Med School and beyond, I’m sure. I still get flashbacks to Anatomy Lab whenever there is a smell that is similar to formaldehyde. Fortunately, there aren’t that many of them. Formaldehyde, that is just a thing that sticks with you. Physically too! It really sticks with you after you’ve left the lab and you have to shower a couple times to get that smell out. DM: Yup, definitely! Definitely. It would be nice though if they had bothered to change out of their scrubs. If they had done that then you’re like, ok, you at least put in an effort. FA: We’ll come back to Dan in a moment. When he said scrubs he actually reminded me of another interview I had with Christopher Showers who went to Columbia. DM: Our cadaver was an 81 year old gentleman. We called him Adam because he was missing a rib on one side and so we thought that would be a pretty clever reference to Adam from the Bible. FA: What I wanted to know next though was where they even began with the dissection. DM: The first incision we made was on the very first day. Kind of an innocent benign first lab. It was the muscles of the back so the cadaver was face down, not a lot of identifiable features that would be unique to identifying the person like the hands or the face that are so just so human, it was just a back. They’re almost two dimensional. Nevertheless, that first incision was just… you’re shaking. You know, we can’t do any harm to this cadaver obviously but it was that element of respect like I want to respect this cadaver. DR. EMMA HUSAIN: I remember the cadavers… that didn’t strike me any way, they don’t really seem like people. FA: That’s Dr. Emma Husain. She went into orthopedic surgery after graduating from McGill University in Canada. EH: One of the reasons for that is that you begin dissection on the back. You do the trapezius, the traps, so you don’t see a face or hands which are the most human parts, right? Surgery is the same way, I mean we drape the patient for sterile purposes but then ultimately what you have is a little strip of skin and a hole and you go in and dig around and do some stuff. It’s not really a person until you see their hands or their face. I’ve always noticed that. So it was turning the body over, which happened much later, where the was a little moment of, “Oh…” You know? ‘Cause this person has really straight teeth or a big nose or really nice thick hair or you know, things that make them human to me. On that topic, I think the time that hands…just remembering hands was really…umm… upsetting was when I was in surgery in Montreal. It was an orthopedic surgery rotation and a sixteen year old girl got hit by a car. She had multiple liver lacerations, a head injury, crushed chest. She was a pedestrian so it was really bad. They were trying to operate on her and stop all of the… there were so many problems multiple surgeons were standing by as well as Ortho to deal with any fractures later. And she died… And I remember her hands. Cause she had pink nail polish on because she was a young girl. Again, you know, sometimes there’s a line between you and the person on the table and sometimes that line just blows away. I’ll never forget those little hands, the little hands of a little girl who hasn’t even finished growing. This chipped pink nail polish on these not very well filed nails, a real typical little girl hand and that really struck me. So I think it’s easy to dehumanize patients but for some reason, seeing their hands… I guess I’m also in a surgical context where they’re not talking or anything. Seeing their hands has always reminded me of how this is a precious human life that I’m looking at and not a job that will keep me up ’til two ‘cause I’m on call, you know? DM: Something that really resonated with me was a thing that I think a chancellor had said to us on our arrival to medical school and before we had gone down into labs is, “This is your first patient as a medical student.” Obviously, they weren’t alive but in a lot of ways you wanted to take just as much care of them and respect them and the integrity of that partnership, much like the patients that we would then have for the years to come. That is how we learn. We learn best from our patients. FA: And as much as medical students and professionals learn from their patients, they — and we in general as human beings — can also learn from each other. Much more than the technical stuff, more than “right answer/wrong answer”, “this is how you suture.” They can learn how to navigate the sea of complex, swirling emotions that we all experience along our paths. Feeling mediocre at best. Coping with intense amounts of pressure and staying human through it all. There is value in this. In the sharing. In the listening and absorbing and by hearing these true, very personal experiences of vulnerability or anticipation, fear and doubt, happiness and heartbreak — told as a memory, from a distance, on the other side of graduation or residency and achievement — we can honor the beginning of the journey. We can see it for what it really is, a start. Because, after all, everybody’s gotta start somewhere. Stayed tuned for Episode 2 we’ve got some awesome Awkward Patient Encounters to share, coming soon to a listening device near you. And remember, guys: Don’t take a selfie with a bear, or you could become someone’s first cadaver. CS: The other thing I’ll say and I don’t know if this is appropriate for a podcast or not, but our cadaver was incredibly — it was a male — he was incredibly well endowed. So it was like some sort of bizarre joke but people would come from around the lab and be like, “Oh my gosh! You guys have a particularly healthy man!” It became kind of a running joke that we had won the cadaver lottery. Not that it really furthered our education or anything. MST AD: This episode of “My First Cadaver” was sponsored by Med School Tutors. Med School Tutors has the talent, resources and experience to personally prepare potential heroes for one of the most important tests of their lives. 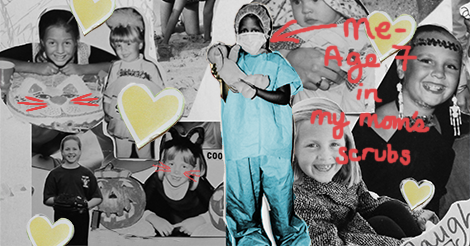 Let Med School Tutors be a part of your origin story. Together, we can save the world.